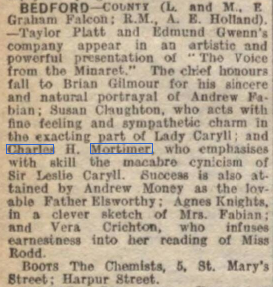 Gloucester Citizen - Saturday 12 March 1921. 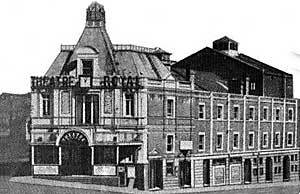 Theatre and Opera House, Cheltenham. 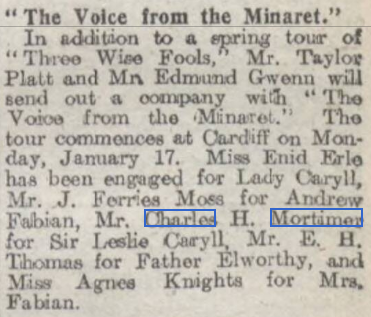 "The cast has been most carefully selected and includes J.Farries Moss, Charles.H.Mortimer, E.W.Thomas, Miss Agnes Knights, Enid Lindsay, and Enid Erle." 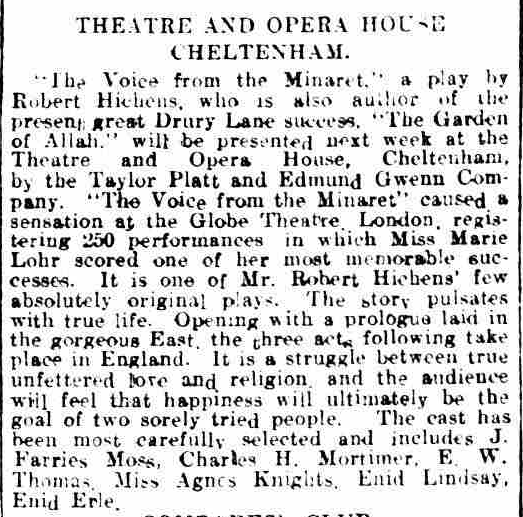 Gloucester Citizen - Tuesday 15 March 1921. Theatre and Opera House, Cheltenham. 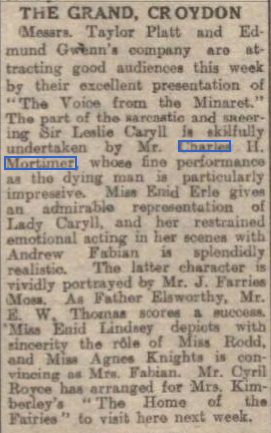 "Mr Charles.H.Mortimer completed a trio of forceful actors, playing the thankless villain part of Sir Leslie Caryll, with much art, and giving an almost too realistic impression of a victim to spitefulness and heart disease in the final scene." 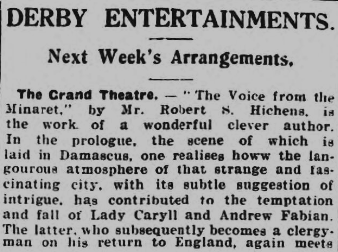 Derby Daily Telegraph - Saturday 1 October 1921. 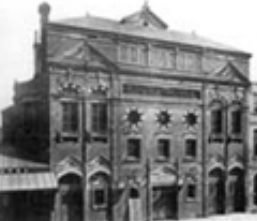 Grand Theatre, Derby.
" The cast includes Brian Gilmour, Charles.H.Mortimer, John Raymond, Wallioe Durdan, Agnes Knight, Vera Crichton, and Susan Claughton." ....and at the Grand Theatre, Derby. 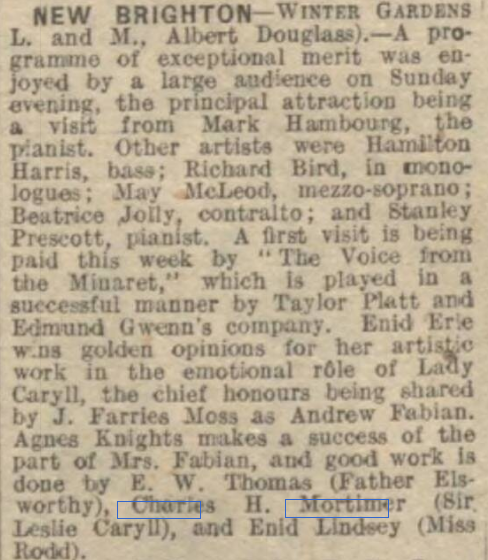 An article from the Devon and Exeter Gazette of 1 March, 1921. From the The Citizen of 21 March,1921. 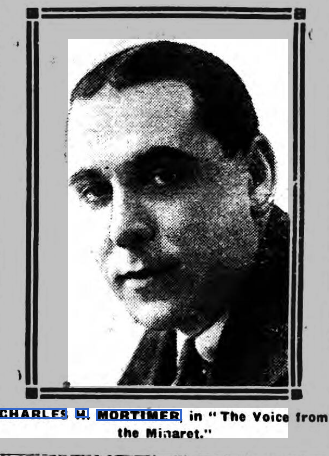 Taken from the Bath Chronicle of 7 May, 1921. From The Era of 28 September, 1921. "THE VOICE FROM THE MINARET. 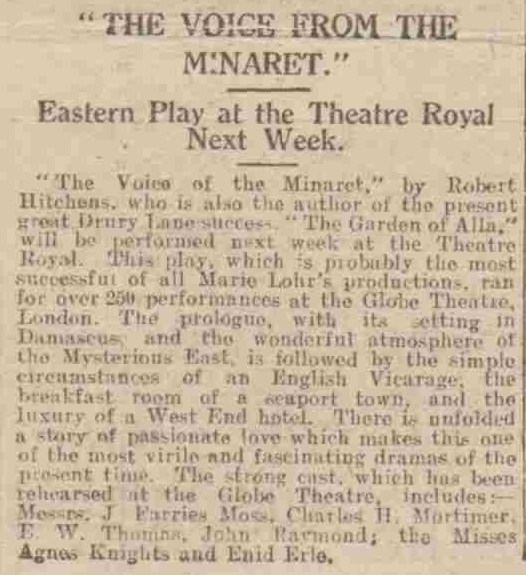 Messrs. Taylor Platt and Edmund Gwenn's company, in "The Voice from the Minaret,” were given an enthusiastic reception at the Palace Theatre, Ramsgate, on Thursday and the remainder of the week. 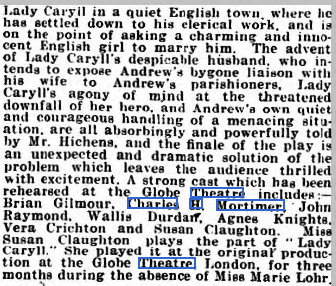 The outstanding feature of a capital performance was the remarkably fine character study given by Mr. Charles H. Mortimer as the brutal husband. Sir Leslie Carlyll. He made a profound impression in the strong act between the husband, the wife and the lover, and his acting in the death scene was a vivid piece of realism. The complete subordination of his own personality in that of the character had the reward of gripping the audience throughout. Mr. Brian Gilmour was convincingly natural as the Rev. 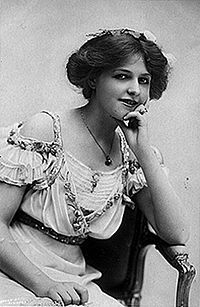 Andrew Fabian, and Miss Susan Claughton acted with dramatic intensity as the wife, Lady Caryll. 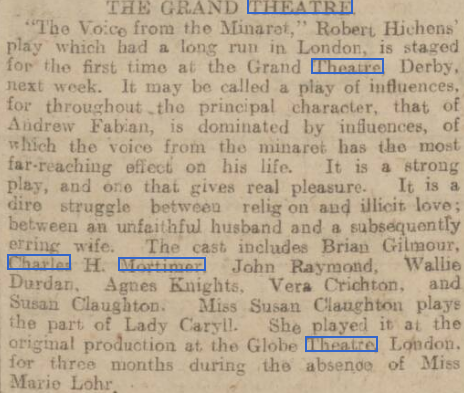 A clever piece of acting was contributed by Miss Agnes Knights as the clergyman's fond mother.